First, it eliminates the outer 'stock' shock position that isn't used. By doing this, the stock middle hole becomes the outside hole, as well as the inner hole. But as an additional tuning 'Option', we have added a hole between them. This will offer a fine adjustment for the different grip levels found in modern racing. Second, the Wing Mounts have been moved up 2mm to put the wing in cleaner air. Testing has shown that this adjustment gives the car more overall downforce and makes it harder to traction roll. This is very much in line with F1 Aero packages. 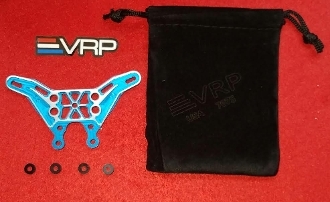 * CnC Machined, Anodized, and Laser Etched at the VRP Factory in Houston, Tx. Totally made in the USA. NO CHINA. You WILL see a difference.